Transcriptome analysis has made the leap from bulk population-based studies to the single cell, and scientists are harnessing this new degree of resolution with remarkable ingenuity. 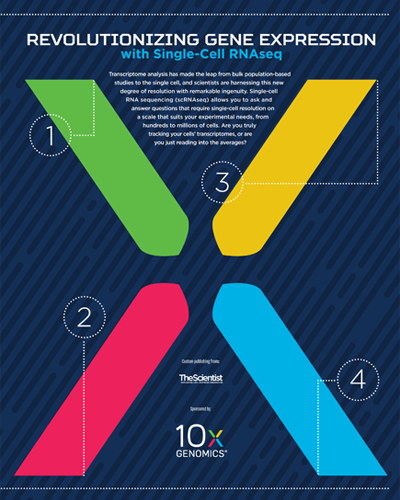 Single-cell RNA sequencing (scRNAseq) allows you to ask and answer questions that require single-cell resolution on a scale that suits your experimental needs, from hundreds to millions of cells. Are you truly tracking your cells' transcriptomes, or are you just reading into the averages? Download this poster from 10x Genomics to learn more.